Members must play a minimun of two JHGA tournaments prior to the Club Championship to be eligible to compete for the "Club Champion" title. Local Rule for Accidental Movement of a Ball on the Putting Green, Effective January 1, 2017. If a Committee wishes to introduce such a Local Rule, the following wording is recommended: Accidental Movement of a Ball on a Putting Green Rules 18-2, 18-3 and 20-1 are modified as follows: When a player’s ball lies on the putting green, there is no penalty if the ball or ball-marker is accidentally moved by the player, his partner, his opponent, or any of their caddies or equipment. The moved ball or ball-marker must be replaced as provided in Rules 18-2, 18-3 and 20-1. This Local Rule applies only when the player’s ball or ball-marker lies on the putting green and any movement is accidental. Note: If it is determined that a player’s ball on the putting green was moved as a result of wind, water or some other natural cause such as the effects of gravity, the ball must be played as it lies from its new location. A ball-marker moved in such circumstances is replaced. Membership applications must be completed and submitted at the pro-shop. Do not take one from the pro-shop to be completed and submitted later. • Withdrawal of Rule on Ball Moving After Address – Rule 18-2b (Ball Moving after Address) has been withdrawn. This means that if a ball at rest moves after the player addresses it, the player is no longer automatically deemed to have caused the ball to move. A one-stroke penalty under Rule 18-2 will be applied only when the facts show that the player has caused the ball to move. • Limited Exception to Disqualification Penalty for Submission of Incorrect Score Card – A new exception has been introduced to Rule 6-6d (Wrong Score for Hole) to provide that a player is not disqualified for returning a lower score for a hole than actually taken as a result of failing to include penalty strokes that the player did not know were incurred before returning the score card. Instead, the player incurs the penalty under the Rule that was breached and must add an additional penalty of two strokes for the score card error. In all other cases in which a player returns a score for any hole lower than actually taken, the penalty will continue to be disqualification. • Modification of Penalty for a Single Impermissible Use of Artificial Devices or Equipment – The penalty for a player’s first breach of Rule 14-3 (Artificial Devices, Unusual Equipment and Abnormal Use of Equipment) during the round has been reduced from disqualification to loss of hole in match play or two strokes in stroke play. The penalty for any subsequent breach of Rule 14-3 will continue to be disqualification. Notice to members who are using "fewpb.net" as your email source, the plant board has discontinued their email servic.When you create your replacement email account be sure to send that mail address to me, at jhgagolf@gmail.com, so I can update the membership directory. A: I've had four holes-in-one and one double eagle, but the best shot was a hole-out eagle with a wedge as darkness fell on the last hole of the (2013) Governor’s Open to win by a shot. March first will be the beginning of the golf season in Kentucky. Meaning, all rounds played in Kentucky after that date will be elgible to post the scores for your current handicap. Remember, we can post scores that are played from any of the four tees, so even if the winter tee markers are still located in the red tee area you should post the score using the red tee setting. You'll need to renew your membership to be able to post scores. Each members Tee Handicap is calculated by your index multiplied by the tee slope/rating then divided by 113. Your index, which is calculated from the average differential, will be the same for all four tees. How your handicap is calculated is explained on the USGA website. When posting a score that was played on an earlier date, be sure to set the date to the day the round was played. Not to the day that you are posting it. Scores from rounds played from Dec. 1 through Feb. 28, on courses in the “Inactive Season Area”, for example, Kentucky and North, cannot be posted. 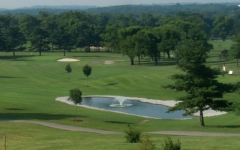 If you play a round on a course that is in the "Year Round Season Area", Tennessee and South, you must post that score and you should post it at the course where the round was played. From the USGA on posted scores when playing preferred lies. Section 7-2. Pitfalls in adopting preferred lies. Before a committee adopts the local rule permitting preferred lies and winter rules, the following facts should be considered. (d) Extended use or indiscriminate use of preferred lies will place players at a disadvantage when competing at a course where the ball must be played as it lies.